As minutes turned to hours, the FEC found itself largely defenseless against what may be the worst act of sabotage in its 38-year history. The government had furloughed all 339 agency employees, save for the presidentially appointed commissioners, and not even one staffer had been deemed “necessary to the prevention of imminent threats” to federal property, the minimum measure for keeping someone on the job. This hacking ordeal, confirmed by three government officials involved in an ongoing investigation that included the Department of Homeland Security, marks the nadir of a year that ranks among the commission’s darkest, according to a six-month investigation by the Center for Public Integrity. The commission over the past year has reached a paralyzing all-time low in its ability to reach consensus, stalling action on dozens of rulemaking, audit and enforcement matters, some of which are years old. Despite an explosion in political spending hastened by key Supreme Court decisions, the agency’s funding has remained flat for five years and staffing levels have fallen to a 15-year low. Analysts charged with scouring disclosure reports to ensure candidates and political committees are complying with laws have a nearly quarter-million-page backlog. Commissioners themselves are grappling with nearly 270 unresolved enforcement cases. Staff morale has plummeted as key employees have fled and others question whether their work remains relevant. Among top FEC jobs currently unfilled or filled on an “acting” basis: general counsel, associate general counsel for policy, associate general counsel for litigation, chief financial officer and accounting director. The staff director doubles as IT director. 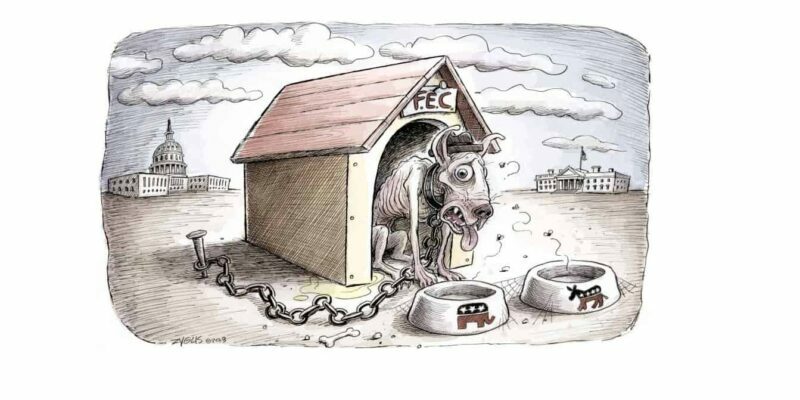 As the nation heads into what will undoubtedly be the most expensive midterm election in history and a 2016 presidential election that, in no small way, has already begun, the FEC is rotting from the inside out. 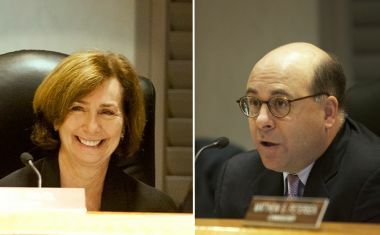 Two newly minted commissioners, Republican Lee Goodman and Democrat Ann Ravel, have pledged to find common ground and work to strengthen the FEC’s standing. Odds are that they’ll lead the agency next year as chairman and vice chairman. The other commissioners talk of the agency reasserting itself after months when the six-member commission operated with only four or five slots filled. But plenty of folks don’t believe them. The roots of the agency’s dysfunction remain in place, reformers and some former commissioners argue. Only wholesale reforms, they say, could pull the FEC from plunging into irrelevancy. The FEC began operations in 1975, created and structured by Congress to be independent — largely in reaction to the Watergate scandal. The fledgling agency’s mandate: enforce federal election laws, especially those that govern how political candidates, parties and committees raise, spend and disclose their money. The agency is also tasked with administering the public funding of presidential races and standing as a bulwark against those intent on undermining fair elections. It lacks criminal enforcement authority, but uses its civil power to audit and levy fines for people and organizations that violate what’s now 229 pages worth of election laws and 550 pages of related regulations. Its jurisdiction ranges from punishing slam-dunk lawlessness — committees not filing mandatory disclosures or submitting incomplete information — to arbitrating the most esoteric, legalistic questions about cell phone use or advertisement print size or electronic money. The FEC’s early years were hardly placid. The commission had few resources. Election law changed regularly during the late 1970s. An untested staff didn’t always perform efficiently. And unlike most federal agencies, the FEC featured three commissioners from each political party — a lineup that frequently made quick action on politically sensitive issues difficult. But during the 1990s, as political parties injected unlimited “soft money” into campaigns and elections grew more and more expensive, the FEC’s stature soared and so did its budgets, about doubling between 1992 and 1999. The agency started posting campaign finance disclosures online, and legions of Americans outside the Beltway began using its resources for the first time. Commissioners steadily assessed more fines against non-compliant candidates and committees as commissioners, despite their philosophical differences, did often find agreement on whether someone broke a law. In 2002, Congress passed — and President George W. Bush signed — the Bipartisan Campaign Reform Act, which among other reforms banned those unlimited “soft money” donations to political parties. The Supreme Court largely upheld the law the following year despite a challenge by Sen. Mitch McConnell, R-Ky., a fervent opponent of campaign contribution limits, and like-minded allies. But election reformers’ celebrations would prove fleeting, thanks in large part to McConnell. By the presidential election year 2008, the FEC literally couldn’t function — only two commissioners remained on the job as McConnell demanded that the Senate vote on pending nominees as a package, not individually as Democrats wanted. Democrats sought to block the confirmation of Republican Commissioner Hans von Spakovsky, whose temporary appointment had expired and whom they criticized for backing voter identification laws and taking a largely deregulatory approach toward interpreting campaign laws. After a half-year idled by too few commissioners to conduct business in the midst of a presidential election, the parties reached an uneasy pact. 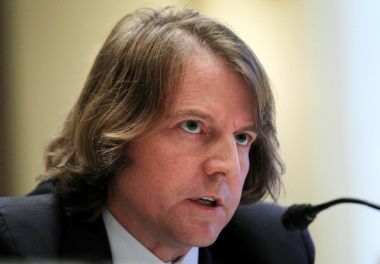 The U.S. Senate in mid-2008 then confirmed as commissioners Republican Don McGahn — a kinetic lawyer and quick-witted rock-band guitar player who abhorred campaign regulations — along with current Republican commissioners Caroline Hunter and Matthew Petersen and Democrat-backed Steven Walther, who identifies as an independent. Former FEC Commissioner Don McGahn. The youthful, lawyerly Republican bloc of McGahn, Hunter and Petersen arrived at the FEC just as federal courts began handing conservatives a string of campaign finance victories that made it easier for corporations, labor unions and nonprofit groups to directly inject money into political elections. The trio struck up friendships and forged a unified front against campaign finance reform overtures they believed would be overly burdensome, such as forcing politically active nonprofit groups to unveil their backers. The gridlock that ensued can be traced to radically different views among the FEC’s Democrats and Republicans on how elections should be waged. The Democrats, led by FEC Chairwoman Ellen Weintraub, believed the FEC should be a strong regulatory force that checks the political influence of corporations and wealthy donors. The Republicans, led by McGahn, insisted the agency should above all ensure the free speech rights of political actors — rights they believe should include the raising and spending of big money to either promote or lambaste political candidates. For months this year, Democrat Weintraub and Republican McGahn rarely spoke in private and frequently clashed in public, the bizarre final act of their personal drama unfolding at McGahn’s last meeting, on Sept. 12. There, McGahn railed for an hour against Weintraub’s decision as chairman to block commissioners from debating, amending or voting on a public version of the agency’s enforcement manual that a congressional committee had demanded two years prior. The issue wasn’t even on the agenda. Weintraub held firm. She pushed it off for another day, insisting that the matter wait until Goodman and Ravel had been sworn in. McGahn, who resigned in September, says today’s campaign rules — especially those sparked by the Citizens United v. FEC decision — have vindicated his deregulatory philosophy, which equates political spending with free speech. The agency is on track to put more power in the hands of politically appointed commissioners and less in the hands of hired staffers — the way it should be, he argues. And what reformists decry as gridlock McGahn sees as a process through which the FEC is aligning itself with federal court decisions such as Citizens United that make it easier to pour big money into elections. The cold war Weintraub and McGahn fought this year is emblematic of a radically changed dynamic on the commission in which disagreement is the norm — meaning not much gets done. Both Republican and Democratic commissioners who served on the FEC before 2008 say that while they certainly disagreed from time to time, their relationships weren’t disagreeable. On most matters before the commission, they could find enough commonality to cobble four votes together and take action. Come 2008, once the slots were filled, finding four votes for anything possessing a whiff of controversy became increasingly rare. 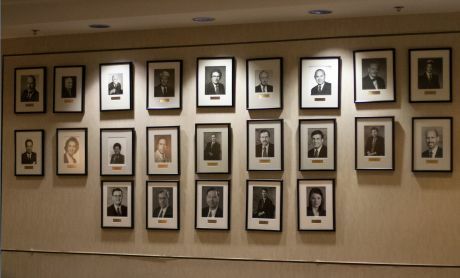 During the rest of 2008, nearly 32 percent of executive session and open meeting tallies failed to reach the four vote mark, either because of absences, or deadlocks. By 2012, about 36 percent of executive session and open meeting votes lacked the support of four commissioners, and during the first half of 2013, the figure rose to 41 percent. As recently as 2007, only 7 percent of such votes had failed to reach the four vote threshold. Source: Federal Election Commission voting records. Note: Votes during open meetings and executive sessions only. Not so, says the GOP’s Petersen, who served as FEC chairman in 2010. “I hear people say … we aren’t even following the law, basically making us sound like we are scofflaws. Those sources of criticism are completely unfair and inaccurate,” he said. What can’t be disputed, though, are the issues that were left in limbo by the deadlocked votes, regardless of where blame is best directed. Among the litany: whether Karl Rove-backed American Crossroads could produce “fully coordinated” advertisements with candidates without violating anti-coordination laws and if a 2012 television advertisement featuring audio of President Barack Obama speaking depicts a “clearly identified candidate” and therefore should be subject to disclosure rules. The commission has deadlocked three times since 2010 on whether to broach the issue of forcing politically active nonprofit organizations to disclose their donors. It’s an issue that the Internal Revenue Service, not the FEC, is now poised to tackle next year, having just announced proposed rules on how such groups may operate. Disagreements on how to enforce election laws have contributed to a drop in agency fines for political committees that haven’t followed the letter of the law. In 2006, the FEC assessed more than $6.7 million in fines — an all-time high — for violations ranging from not disclosing campaign donors to filing mandatory campaign finance reports late. By 2012, it collected less than $1 million in fines, one of its most meager years since 1995, according to agency records. Commissioners are voting on far fewer enforcement matters, from more than 1,000 annually during the middle of last decade, to fewer than 200 annually early this decade — the result of an overtaxed staff and commissioner disagreement. In several dozen instances, commissioners either refused to approve enforcement settlements FEC attorneys had reached with an offending party or couldn’t get four votes in place to approve the general counsel’s recommendation to punish a candidate or committee. As of early December, the commission has yet to resolve 268 pending enforcement cases, agency officials confirm. Commissioners acknowledge the backlog is unacceptable. In September, for instance, Rep. Steve Stockman, R-Texas, avoided penalty when the FEC couldn’t find four commissioners to concur with staff attorneys that the congressman’s campaign had run political advertisements without including mandatory disclaimers. Democrats favored action; Republicans didn’t. In 2008, commissioners deadlocked on whether to accept FEC staff’s fine settlement with the Washington State Democratic Central Committee, stemming from the embezzlement of campaign money. The same year, the FEC deadlocked on accepting the payment of an FEC fine a congressional candidate had already made. In 2012, the agency aspired to process enforcement cases within 15 months of receiving them. In reality, it did so 70 percent of the time, internal records show. It also sought to process 75 percent of cases assigned to its “alternative dispute resolution” program — a way for the FEC to exact “more expeditious resolution of enforcement matters with fewer resources” — within 155 days. It did so about half the time. And while the FEC aimed to conclude all non-presidential committee audits in an average of 10 months after the election — excluding delays caused by developments beyond the commission’s control, such as subpoenas and extension requests — it hit that benchmark just 27 percent of the time. The FEC in part blamed the underwhelming performance on its own procedures, instituted in 2009 and 2010, that allow committees to more readily respond to findings and the commissioners themselves to more closely review audits. The commissioners’ case docket, meanwhile, sometimes reads like an American history book, with certain disputes or allegations of election law violations dragging on for years. The FEC seals the details of pending cases, making it impossible to know how old the oldest active case is. But among the more extreme examples of recently closed cases that lingered for years is a 2003 complaint by the American Conservative Union against a supporter of former Sen. John Edwards’ 2004 presidential committee. The FEC, in 2012, ultimately decided not to fine the man because he had no money. Another involves the presidential committee of former Sen. Chris Dodd, D-Conn., who dropped out of the presidential race in early 2008. Dodd’s campaign got its day before the FEC this year, on Feb. 7. John McCain’s 2008 presidential committee won dismissal of a case against it on May 7. In a separate matter, resolved in July, McCain’s committee paid an $80,000 fine stemming from a complaint lodged in October 2008 by the Democratic National Committee, which accused McCain of accepting excessive contributions and improperly disclosing others. The FEC did score a $375,000 judgment against Obama’s campaign early this year for failing to report the identities of some high-dollar donors. But the incident stemmed from Obama’s 2008 campaign, not his 2012 re-election. Sometimes, the FEC threatens action only to take none. Take the case of Newt Gingrich’s 2012 presidential campaign. The former House speaker’s committee has more debt on its books — about $4.5 million — than any other White House also-ran. The FEC has for months harangued him for not properly disclosing the nature of his debts and reimbursements to campaign staffers, including Gingrich himself. Gingrich treasurer Lisa Lisker has each time told the FEC, in effect, to buzz off. The FEC has yet to fine or otherwise sanction Gingrich, who hasn’t been a candidate in 20 months and now co-hosts CNN’s Crossfire program. As a regulatory body, the FEC is also supposed to write rules that help interpret federal election laws and provide the public clarity on what’s acceptable during political campaigns. In years gone by, this responsibility kept both staff and commissioners busy. Early last decade, it routinely produced upward of half-a-dozen new rules annually. This year, in contrast, the FEC has approved just one rule — a wholly uncontroversial measure to adjust civil monetary penalties upward so they keep pace with inflation. And it’s not like there’s been nothing to issue rules about. It’s been nearly four years since the Supreme Court’s landmark Citizens United v. FEC decision, which allows corporations, unions and special interest groups to spend unlimited amounts of money to directly advocate for or against candidates. Yet the commission has yet to write rules interpreting any aspect of it, even the decision’s most fundamental elements —such as the right of corporations and unions to dip into their treasuries to overtly advocate for and against political candidates. Nor has the commission made rules to implement the federal court’s SpeechNow.org v. FEC decision, which gave rise in 2010 to super PACs, or the Carey v. FEC ruling, which legalized hybrid PACs — political committees that may at once operate as super PACs and traditional PACs so long as they keep separate accounts for both. The minutiae of proposed rules in these areas aren’t commissioners’ stumbling blocks; they simply haven’t tried. The gridlock has coincided with another, decidedly less visible problem the FEC faces: enough resources to execute its most basic tasks, such as reviewing political committees’ financial reports, which are central to the agency’s campaign-cop-on-the-beat function and vital to the public’s understanding of how elections are waged. Source: Federal Election Commission, Office of Management and Budget, U.S. Congress. Source: Federal Election Commission personnel records. Note: Staffing levels are for late September of each year. It wasn’t always that way. In eight years, from 1992 to 2000, the FEC’s funding more than doubled, from $18.8 million to $38.4 million, federal records show. Funding growth continued throughout the 2000s as the tiny agency sought to keep pace with ballooning workloads. But that growth has slowed, thanks to tight budgets, sequestration and a recalcitrant Congress. Over the past eight years, funding is projected to have increased from $54.2 million in 2006 to $65.8 million for 2014. When accounting for inflation, the FEC’s estimated funding in 2013 is about the same as it was in 2003. Meanwhile, the politics business that the FEC oversees is exploding. The 2005-2006 federal election cycle cost $2.85 billion for politicians and political committees, according to the Center for Responsive Politics. The 2011-2012 election cycle? Nearly $6.3 billion — a 120 percent increase. Pro-Mitt Romney super PAC Restore Our Future alone spent double the FEC’s budget. Employment at the FEC peaked in 2005, at 385 staffers — 372 permanent, 13 temporary — agency personnel data indicates. Since then, the numbers have steadily snaked downward. By the end of fiscal 2009-2010, as the effects of the Citizens United v. FEC decision took hold, the agency fielded 349 workers. And three years later, at September’s end, the agency had bled 11 more positions. Not since the turn of the millennium has its ranks thinned to such a level, internal staffing rosters show. Hardest hit is the Reports and Analysis Division, which makes sure political candidates and committees comply with campaign laws. Eleven of its positions are unfilled despite the agency processing record numbers of political transactions — 23 million in 2012 alone. Instead of an individual analyst monitoring 200 to 300 political committees, as is normal, they’re today sometimes shouldering more than 500. Entry-level analysts earn about $52,000 annually. As of mid-November, 2.2 million pages worth of FEC disclosure reports had not been reviewed by staff for errors, anomalies and completeness — an estimated 22-week backlog, confirmed Goodman, the new Republican commissioner. On average, FEC staffers review about 100,000 such documents a week, although that figure in November has slid to 84,000 each week because of short staffing, he said. To remedy staffing woes, FEC commissioners argue in one voice that the agency needs cash. And in a 45-page document the FEC sent in September to Congress at the Office of Management and Budget, it asks for a modest raise — to $68 million annually — for fiscal year 2015. Most of the extra cash, the FEC proposes, would go toward better compensating staff and shoring up its IT capabilities. Commissioners acknowledge that the agency’s website, where its millions of campaign records are published, is woefully clunky. Searching for items as simple as a complaint against a candidate often proves difficult. Generating a list of something as fundamental to campaigns as payments to vendors is impossible. Read the full audit report. Numerous staffers say the agency’s creaky IT systems are at greatest risk if more funding — and a major attitude adjustment on the part of top managers — isn’t forthcoming. An independent audit of FEC operations last year by Leon Snead & Company P.C. all but predicted October’s Chinese hacking incident. In a statement, the FEC acknowledged that hackers have targeted FEC systems but offered no details. Weintraub, the commission chairman, refused to comment or to acknowledge that the hack during October’s government shutdown originated overseas. 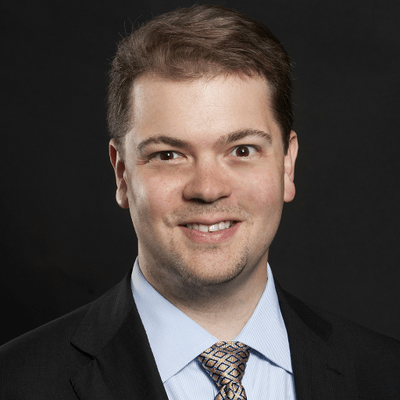 Commissioner Walther, however, said in an interview that FEC Staff Director Alec Palmer, who also leads the agency’s IT division, should be removed from one of his two postings. “We have simply not addressed our security needs, and there is no excuse for not giving this attention,” Walther said. Palmer, who at $165,300 annually earns more than the $155,500 salary commissioners do, declined to comment. Before the shutdown, Weintraub had warned that a work stoppage would throttle the agency. It did. People who could address the hacking problem found themselves barred from work. Ultimately, the government recalled FEC staffers on an emergency basis to address the system meltdown that was crippling FEC.gov during a time when federal law required candidates and committees involved in two special elections — New Jersey’s U.S. Senate race and Massachusetts’ 5th District congressional contest — to file disclosure reports. In desperation, Weintraub took to Twitter and asked political committees to post disclosures to their own candidate websites in the name of transparency. If the government shuts down again, Weintraub said, she’d demand at least some FEC staffers remain at work. Commissioner Hunter, though, disagrees. A government shutdown is a government shutdown. “The FEC is not essential to the operation of the republic in the same way, say, the Department of Defense is,” she said. As the FEC’s internal schisms have widened and resources have dwindled, a wave of high-ranking staff members have grown increasingly disenchanted with the agency some had called their professional home for years, even decades. Several said they retired earlier than planned. Others simply quit. 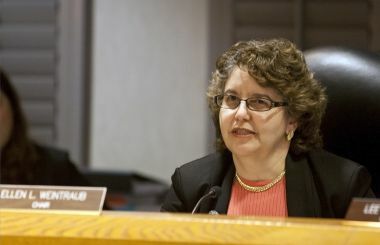 Democratic Commissioner Cynthia Bauerly resigned in February and returned home to Minnesota, where she now works for the state’s Department of Employment and Economic Development. General Counsel Tony Herman resigned in July after just two years on the job. In part stymied by commission inaction on a variety of recommendations his office made, Herman decided to take a job at his former law firm, Covington & Burling LLP. His departure triggered widespread rumblings about the commission’s ability to work with its staff and whether Republican commissioners in particular were on a quest to purge high-level employees they considered obstacles to consolidating power at the commission level. For months this year, commissioner McGahn spearheaded a Republican effort to approve a public FEC enforcement manual that, among a host of actions, would require commission approval for various decisions now primarily in the hands of staffers. Herman and many top staffers and Democratic commissioners were opposed. Since his departure, though, the commission has yet to even name an acting general counsel. “Morale was very low, and understandably, when morale is low, people don’t do their best work,” he said. There have been numerous calls for reform at the agency over the years, but the process has been stymied in part because some influential politicians — especially Republicans — philosophically disagree that the FEC should wield significant power. “We’re talking about regulating political speech, a constitutionally protected freedom that must be approached with extreme caution,” said Rep. Gregg Harper, R-Miss., a member of the Committee on House Administration, which has FEC oversight responsibilities. Destroying the current 3-3 partisan balance “would just create a temptation for that majority to extend campaign finance laws beyond their legitimate scope,” he added. For Rep. Robert Brady, D-Pa., the House Administration Committee’s ranking member, the recent wave of changes to the election landscape — starting with the Citizens United v. FEC decision and continuing now with the Supreme Court’s pending McCutcheon v. FEC case — make the FEC’s regulatory duties more important than ever. “It will fall entirely upon the FEC to guide members and candidates through this uncertain territory, and right now I’m not convinced the agency is capable of doing so,” Brady said. Jan Baran, chairman of Wiley Rein LLP’s election law practice and former general counsel for the Republican National Committee and President George H. W. Bush’s 1988 campaign, suggests Capitol Hill is the FEC’s most notable obstacle. “If there’s one problem the FEC has always had, it’s Congress. It can’t even agree on what the law should be,” he said. Beyond freezing its funding for years, Congress hasn’t passed a single one the FEC’s most recent volley of legislative recommendations, on which all commissioners — Democratic and Republican — actually agreed this year. The asks include passing a law that makes Senate candidates file campaign reports electronically, not on paper — at an estimated $430,000 savings to the federal government — and making it illegal for anyone to misrepresent themselves as working on behalf of political candidates or committees when they don’t. Moreover, Capitol Hill has brushed off an overture to create senior executive service positions at the FEC — much like those that exist at myriad other agencies — and won’t heed commissioners’ plea to ban people involved with any political committee, not just candidate committees, from using money raised for personal use. A repeatedly introduced House bill prohibiting the practice among leadership PACs has sat in committee for months, and a separate bill, the Clean Campaign Contribution Act of 2013, is also stuck in committee. The lone exceptions? The House approved a bill that extends the FEC’s administrative fine program — used to punish minor violations without full-blown investigations — through 2018. It awaits a Senate vote. In 2003, and again in 2006, 2007 and 2009, Sens. McCain, R-Ariz., and Russ Feingold, D-Wis., attempted to reclaim some of their campaign reformist magic following the 2002 passage of the Bipartisan Campaign Reform Act, which banned unlimited “soft money” contributions to political parties. To do so, the cross-aisle senators introduced bills that would dissolve the FEC and, from its ashes, create the “Federal Election Administration.” A key feature of the most recent proposal: installing a three-member administration panel to prevent deadlocked votes. But the Senate referred the bills to its Committee on Rules and Administration, where they sat, then died, without a hearing. Feingold is no longer in the Senate; McCain, whose office declined to comment, stopped trying. Little in the way of Congress-initiated FEC reform has surfaced since. “We’re not anyone’s No. 1 priority,” Weintraub concedes. Don’t look to Obama for major FEC reforms, either. The president once regularly railed against the Citizens United v. FEC decision and decried the influence of big money in the political process, but his recent track record is hardly reformist. Indeed, Obama became the first president since the FEC’s creation to not successfully appoint someone to the FEC during an entire term. His lone nominee, labor lawyer John Sullivan, withdrew from consideration after the Senate blocked his consideration. McGahn’s term expired April 30, 2009. The White House could have nominated his replacement at any point during the next four-plus years. It chose not to, and McGahn kept working against campaign reformers’ most every demand. By 2012, Obama had given his blessing to supportive super PACs. In 2013, he supported the formation of Organizing for Action, a 501(c)(4) nonprofit political lobbying group that reveals limited information about its donors. These actions, campaign reformers say, eviscerated any hope they had that the president would push back against election deregulation in a meaningful way. White House spokesman Eric Schultz declined comment. But hope persists, even at the FEC. Upon their nominations for the FEC on June 21, Weintraub sent Goodman and Ravel effusive email messages — the McGahn era appeared to be nearing an end. For Goodman and Ravel, their time is now. Come this winter, the FEC will likely elect Republican Goodman as its chairman and Democrat Ravel its vice chairman, since all other current commissioners have had their turn in the rotating leadership positions. It’ll be their agency to direct. “I am an eternal optimist, and if I wasn’t, I wouldn’t be here,” said Ravel, who in October as chairman of California’s Fair Political Practices Commission oversaw the outing of numerous donors to nonprofit organizations that sought to influence a ballot initiative vote. Whether newfound collegiality translates into functionality, however, remains an open question. In a headline-generating case in November, the Conservative Action Fund, a PAC, asked the newly constituted commission to provide guidance on whether it could raise and spend bitcoins — an all-digital currency. FEC staffers drafted four plans of action, spanning 83 pages, for commissioners to consider. The Republicans supported the most permissible option. Democrats blocked them. Another 3-3 deadlock. The PAC — and by virtue of the decision, all political committees — left the FEC’s 9th floor chamber at 999 E St. in Washington, D.C., back at square one, no answer in hand. “We will continue to work on these very interesting issues,” said Weintraub, the chairman, who promised the commission would revisit the bitcoin matter sometime in the future. No date for doing so has yet been set.